After a few months of eager waiting, [Brook Drumm] has finally released the files for his paradigm-shifting 3D printer, the Printrbot. If you didn’t order one of these during the Kickstarter, you can now print your own set of parts. [Brook] gave his Printrbot to the world last November with the promise of being extremely cheap, extremely easy to build, and having a relatively high print quality. The simplicity of the Printrbot was amazing, which probably led to the Printrbot getting $830k worth of funding on the initial Kickstarter. Although the files for the 3D printed parts are out in the wild now, there still aren’t any instructions on how to build it apart from a Flickr slideshow. [Brook] promised to release the files for the Printrbot much earlier, but we’re guessing he’s been busy printing and assembling the 1200 Printrbots that were claimed in his Kickstarter. While we’re on the subject of cheap 3D printers, [Richard Sum], the English gent behind the SUMPOD sent in a link of one of his $600 printers milling MDF and extruding for seven hours straight. We’re on the cusp of Star Trek-style replicators here, people. This printer is known to the RepRap community already as “Wobblebot,” and the files for a derivative have been available for a while. I hope this printer lives up the the expectations of its many users. Bit harsh. Lets see what he provides first. I for one liked the updated design and how the electronics are underneath. I seen the basic repraps and these can also wobble. Odd, the only hit I can find for “wobblebot” is your post. And now this one, so I’ve doubled its Google rank. if only i had a device to do all the precision milling it self instead of my shaky hands … oh well a man can dream …. I’m wondering about Z stability myself. Well, a friend of mine ordered one, so we should be able to stack it up against my twice as expensive Ultimaker then. I can tell you now, it will be slower. We’re on the cusp of Star Trek-style replicators here, people. Pardon my french but – the hell we are. We are not even close. I assume this wasn’t meant to be taken too literally but I am getting tired of the hype that 3d printers are getting. I own more than one high definition machine and I understand the advantages and limitations of all of the various types of 3d printing technologies – SLA, SLS, polyjet, 3d printing, lamination printers, extruders, etc. This prints, albeit somewhat poorly, in a single material. It isn’t remotely high quality. It’s only redeeming value is it is fairly cheap. Not that there is anything inherently wrong with that – the industry NEEDS some low end machines. Most of the major manufacturers are trying to hit the 10 – 15k mark right now. Desktop Factory was shooting for the $5k mark (but failed). We are nowhere close to turning energy into matter at an atomic level. We cannot print multiple materials at all no matter what machine you use (with the exception of the Connex) and even metal sintering machines require a large amount of post work, including bandsaw cutting the model off of the printing base and extensive post finishing to improve the resolution of the print. The hype behind 3d printing is ridiculous. The reality is nothing like the hype however. This is a nice miniature step forward but let’s see this for what this is, not for Tea. Earl Gray. Hot. Plenty of FDM machines can do multiple kinds of plastic — as long as you want plastic. I assume you mean things like metal/plastic/carbon, which nobody is doing much of. Nobody is doing truly functional materials in combination with other materials. There are very good reasons why. It’s REALLY, REALLY complicated. FDM is low quality (by design) and can’t be used for much that is terribly useful due to the low quality and poor mechanical properties. It is single material per build although at least one machine can do two printheads on a single build…. it’s not a huge step forward. Nobody is going to be printing lego blocks or replacement car headlights or laptop cases or anytime “useful” using FDM anytime soon – if ever. Some of the industrial machines are starting to reach the quality (SLA and Polyjet) of commercially injection molded plastics but the materials are still acrylics and epoxies. Somewhat strong but they still have their limitations – even setting aside cost. You must not know about the Objet line of printers. Their Connex 500 model can use with up to 14 materials in the same print. Which is why I included the line (with the exception of the Connex) in my text. Comparing 3D printers to Star Trek replicators is just silly. And saying “this will be a revolution! a 3D printer in everyones home!” is also stupid. But it’s not like a coffee machine, not everyone can operate it. It requires maintenance and proper handling. It’s a fun machine, and it can do useful stuff. But it’s not the solution for all world problems. This stuff has been around since the 80s… it’s just that the price has dropped to something you and I can afford. I’ve worked on 2 3d printers and by far this is the most questionable design I’ve seen. It’ll work and it’ll be cheap but it’ll probably cost you in terms of print speed and/or quality. Also reprappers gave up on printed z couplers a while back for real metal ones. I think some of the prints are comparable. Airtripper.com shows an example of the print quality. Do you have a link? All I see on that site are SUMPOD posts. I was trying to show that 3d printers can produce excellent and useful parts. the cheaper ones look all rather the same to me (did not spend hours yet looking into each in detail). The main thing I’m wondering is what you can actually DO with that stuff besides making other re-reps and dolphin statues. Can you really “print” (just an example) reduction gear box with this stuff that can handle some torque (even just thinking about like 1/12 RC stuff league)? I’ve used my RepRap-ish 3D printer for a handful of things around the house. It’s one of those tools that once you have it, you find uses for it that you may have never considered. For example I’ve printed and a couple of things for vehicles, small things like clips and a new bracket for the gear indicator/adjuster for a van. It’s also generated a little income for me by fleshing out some rough ideas/prints for other peoples ideas and inventions. It’s quick and cheap, kind of a nice step before committing to mill aluminum. Then again if you can’t design your own parts in CAD or refuse to learn, then you’re stuck printing crap from thingiverse. I can digg the rapid prototyping use of this (and it seamed logical you want to/can use a cad package if you get something like this). I’m however still rather sceptic on the usefulness of making “final” items with this type of plastic extrusion. How does the plastic used by this stand against some tear and wear (hence the gearbox mentioned)? And if you would print out a enclosure for some pcb (let’s say a little amplifier or so), would it allow to securely put some plugs/jacks into the enclosure (so that the plastic don’t break off after x times plug/unplug ) ? I also assume you then still need to do a rather big amount of “finshing” after the printing to have a box that looks a bit “professional”? I wonder if you could use these extruded parts in molds for more robust foundry methods? eg “lost wax” methods, where you print the mold instead of carving it? forgot the big +10 for the WAF. The gear indicator bracket is actually in the steering column. Here are some pictured of the old and new, and the new one installed. Printed out of ABS, though I normally use PLA. And the part outlasted the van. Almost forgot, Ford wanted a lot of money and 2 weeks for a replacement. Not saying it was an economical solution, just convenient and quick. Regarding quality, the machine and software is constantly being upgraded and modified. So trend has been looking at something printed a few months ago looks fairly crude compared to something more recent. Compared to a couple of stratasys demo parts from work, my printer’s quality is nearing the same quality and finish. I’ve read the comments, and there are always some, that mention the open source printers quality is crap compared to commercial machines and have to smirk a bit. Yeah, it is unrealistic to think you can get the same quality as a laser sintering, or other technology. As a home inventor it is a very affordable option. I can print fairly complex objects that would be more expensive and take more time if they were milled from aluminum, not to mention all the tooling involved. Either way, the expense of a professional tool or printing service is way beyond my budget. Yes, reprap is beyond over hyped. If you can get passed that and spend the time to understand and tune the thing you can get satisfactory prints. Be prepared for some frustration. My prints still look ‘printed’ but they look nice and are durable. If PLA or ABS is used then consideration (read trial and error) needs to be taken for features exposed to mechanical stresses. Something akin to your amplifier question, I’ve made a USB/rs232 adapter bracket to hold an adapter PCB where the cut out for and old DB25 connector. Did several of these for work and they are used on a daily basis, haven’t had to fix one yet. Have you ever priced out a professional service? I have been purchasing parts from professional rapid proto houses for two years now work. Thirty different projects, 3-12 iterations each project. Spent less than $700 total. ZERO post processing required. Tolerances are ORDERS OF MAGNITUDE better than DIY 3D printers. There’s a massive array of different plastic ‘types’ and finishes to choose from so springy, soft, shiny, satin, reflective etc is possible. I really don’t see any benefit to these DIY 3D printers… unless you just want something to tinker with. I have, and it isn’t terribly expensive. Since most quote based on the volume of material used, bigger parts start to get expensive quickly. Especially those that require a substantial amount of material for strength. Please don’t take offense but I am a little suspicious of your numbers. Worst case scenario you are paying on average of ~$8 per model (700/3*30) which is probably less than shipping(?). If they are very small volume parts then I understand. Better yet, you know of an insanely cheap service and willing to share your contact! ;) Some of the items I am printing will cost roughly $50 – $150 for an entire assembly. My costs for a ‘rough’ print are 1/10th that. Shipping time is another thing to consider. Having other responsibilities like family and work it is best, for me, to sit down and get as much done as possible when I have time. Normally that means design / print / tinker / rinse and repeat. The delay associated with processing and shipping really disrupts my style if you will. As my availability to work on a project can be weeks apart. So being able to sit down and go through a couple to several iterations at a time is of great value to me. However, I will seriously consider using an SLS or other service the next time I finish the rough prototype / proof of concept phase of a project. It also allows me to conceive and test a couple of different ideas that will execute the same task with out much expense at all and I feel much better about the final direction of the project. In fact I have a perfect candidate approaching that point. Trust me, I am not under the delusion that these machines can compete with the tight tolerances of other non fused filament technologies and you will never hear me argue otherwise. However, I do believe it has its merits for (very) rough rapid prototyping . If finish quality is of importance then yes, FFD is most certainly not an option. Fortunately I am more concerned with a model’s mechanical functionality, finish is of negligible consequence. I am not arguing the sentiments that RepRap’s are near useless toys. Rather a tools limit of usefulness is limited to an operators skill. Albeit, that pool of people is rather limited and for the majority it is a neat thing that can print other people’s designs. You will also never hear me sing the praises of the open source community with exception to planting the initial seed. There is too much Phallus measuring of who can design the best mechanical/electronic/firm/software platform. Its frustrating to sort the good from the bad and it tends to generate a more adversarial than cooperative relationship between the different camps. Spend a few hours in the #RepRap IRC channel and you’ll understand. Over all its discouraging. Documentation is either inadequate or dispersed. Seeking clarification tends to end up in a scornful answer, that you are using the wrong camps ‘thing’ and you should use their ‘thing’, or why haven’t you read this obscure blog posting for the answer. There are some good people and well documented projects but they are lost in the elitist machismo. So I’ve resigned myself to lurking and developing/modifying tools that work for me. To conclude, these are the reasons that make the RepRap a tool and not a toy for *me*. -Inexpensive print materials, allows me to test some ideas I would normally pass on due to expense. -Opportunities. A few top picks beings a specific gravity meter to monitor fermenting beer, protective cutaway covers for a turbo pump from an apollo rocket, and a combat rifle optics mount that the USMC is interested in. I would have never found these opportunities had it not been for a RepRap Mendel. It isn’t often that a sci-fi reference is blown on hackaday, but weren’t the replicators on Stargate not Star Trek? Replicators were in both, but were different things. 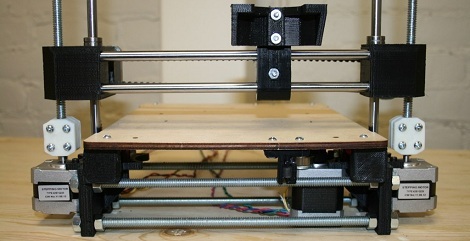 Though, if it ever were to COMPLETELY meet it’s goal, the RepRap projects would do both. The Stargate ones were machines that consumed any raw materials available, and just replicated themselves, taking everything over. In Star Trek, they were machines you would walk up to, and would create nearly anything you want out of thin air. Not out of thin air. They are supposed to use a lot of energy, and I think earlier models (classic series) needed some kind of raw material. wjp: I mean this with complete sincerity after a very intense internal deliberation, but that… I mean… really? I’m at a loss for words here. 0xsomehexnumber: I was under the impression that Star Trek replicators functioned like teleporters but without the ‘exploding every atom’ deal to read the pattern. I don’t think this was ever explained (and how could a teleporter create life when a replicator couldn’t). The ST version used energy to make the stuff. There’s evidence of this in VOY:Year of Hell, where Janeway tells Chakote to de-materialize a pocket watch for some extra fuel. Bottom line, the Star trek replicators were just one level of abstraction away from the ones from Stargate. I don’t know much about the teleporters in Stargate, but I’ll just see myself out now. ST teleporters had “Heisenburg compensators” which could update the quantum state of what was being teleported to meet the state of when/where it was being teleported into. It could only accurately predict the state for a few seconds, after which things get messy. ST Replicators were cruder devices. They could generate stable atoms, which it used to assemble things it had the patterns to make. So Star Trek could create stable atoms and assemble them into more complex things, but had to do the ‘possibly exploding every atom’ thing to transfer plot-critical items, or living beings around. Be very careful with that Richard Sum (Sumpod) guy: It took him more than half a year to deliver the orders from the first campaign. I ordered after the sumpod was featured on HaD last time. He is known for censoring negative feedback on his forum and threatening other places publishing negative feedback about his machine. I found him a very unpleasant person to deal with (actually the most unpleasant online seller I ever met). But to the machine: the strong MDF frame definitely is a big plus. The current stage of developement is still very early, meaning no proper manual, no propely configured firmware and no toolchains to start printing out of the box. The machine is not open hardware and was released without any preconfigured firmware, skeinforge settings, or even a build manual. At the current moment the machine costs 625$ (shipping being another 120$ and customs for everyone outside of Europe) and you will need to sand all parts, primer them and paint them. That’s very time consuming but definitely worth it if you have the time! Right now there are no preconfigured toolchains available for printing and Richard is solely relying on the community to develop these. -read all the links in the wiki, especialy renaissance-engineer.net for the manual and ideasfixer.blogspot.com for painting and background coverage. -ask yourself how much time you have to assemble a printer. while the Sumpod definitely is soemthing very solid, it also takes premium time to assemble. and another premium time to get it working. I’m happy with my machine now but if i knew how much trouble I would have dealing with Richard back then, I’d bought another machine. there were unfortunate delays but these now have been solved. Also I am sorry that you feel you have been treated badly and can contact me anytime. Im sure others dont feel the same. I am happy you now have a working machine. I definitely think that the y-axis is going to be more of a problem than the z, it’s a very interesting idea to put the bearings on the body, and have the smooth rods move, but I think there might well be far too much wobble. I can’t see it being easy to get <0.1mm layer heights, when on tall object the wobble is going to be amplified by the lever than the y-axis is. On the subject of overhypededness, I love my prusa2, and for me it is far more appropriate than a laser sintering/milling machine. Dirt cheap fast prints mean I can go through far more design iterations, and the printed look is made up for by the ease of which I can make organicy parts. Plus, 0.05mm is pretty small for a layer height. Brook Dunn is a really cool guy and I’m glad his 3d printer idea really took off. I’d not buy from anyone else. Thanks Brook. nishu f liked PCB Motor. Ted Yapo liked The Homebrew Steampunk Laptop v2.